Yates Services is seeking qualified candidates for a range of opportunities at all three Nissan manufacturing facilities in the US. Our entry-level Picker/Kitter positions will start at $14.50/hr ($15.25/hr for off-shift) with the potential to grow and transition to associate positions paying up to $23.25/hr. Apply today! What's it like to work at a world class company? Watch the video below and find out! 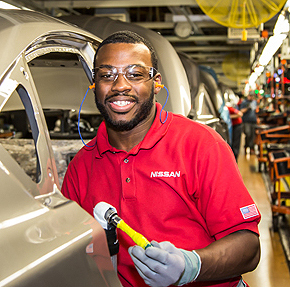 Yates Services provides production support positions at Nissan in Smyrna, Decherd, and Canton. Our maintenance managers and workers are experienced and highly trained to meet the specific needs of Nissan, resulting in a professionally staffed and highly productive program. We offer some of the most competitive wages in the mid-South starting at $14.50/hr for our entry level Picker/Packer/Kitter positions with the potential to grow and transition to associate positions paying up to $23.25/hr! We offer progressive wage increases with our hourly technicians receiving wage increases every six months until a top-out rate is reached. We also provide outstanding insurance benefits, a robust 401K program, paid vacation, and a pathway to Nissan employment. Apply today!